Happy Tuesday to you all! 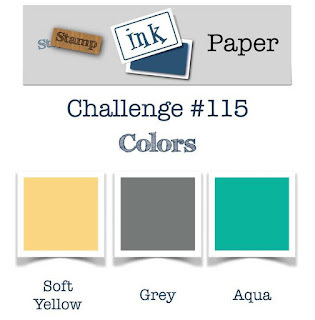 Stamp Ink Paper is back with a fun end of summer color challenge for you to play along with! Did you have a good weekend? We spent most of the weekend inside. We have had terrible smoke around here due to the fires in Montana and surrounding areas. Although, my intention to get housework done didn't really happen, my craft room is almost clean. Obviously after a 3 day weekend with the WHOLE family I was thinking wine when I went into my craft room yesterday morning! 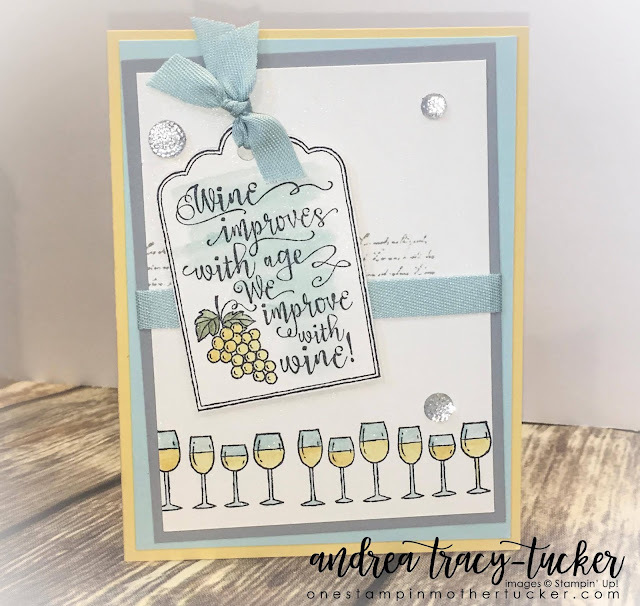 I used the Shimmery White card stock to watercolor my Tag and Wine glasses from the new set in the Holiday Catalog called "Half Full". It was designed by Million Dollar Achiever Linda Bauwin, and of course a must have on my list. The glasses of wine are water colored with Soft Sky and So Saffron with the Aqua Painters. I added some Wink of Stella for sparkle. I decided to fussy cut the tag and color the grapes with So Saffron, however the leaves I used Always Artichoke with my Blender Pens. I used Basic Black Archival for all of my water coloring. The Tag is popped up over the abstract script from Background Bits in the Smoky Slate ink with a nice strip of the 3/8" Classic Weave Ribbon in Soft Sky to coordinate with the tags top that also used the same ribbon. I few silver Faceted Gems and this card was good to go! I hope you enjoy my glasses of Pinot! I can't wait to see what you make for this challenge! I love your card AND I love Pinot Grigio! May I CASE?